Cavs Cavs Archive Apparently Everything in Cleveland Sports Is Now a "Thing"
Things are never really normal in the Cleveland sports world, but lately it seems like it's even more abnormal than usual around here. Apparently it is no longer enough to watch the games and then discuss (or write) about what happened on the field - it seems that now everything must be turned into a thing. From debates over why fans are not going to see the first place (for now) Cleveland Indians play - the Tribe is still in last place in the majors in attendance even though Miami draws like 25 fans a game - to an unnatural infatuation with the Cleveland Browns third-string quarterback (did you hear that Brian Hoyer is from Cleveland? ), arguments and hurt feelings have become the norm. We just never thought the Cavs winning the NBA Draft lottery would turn into one of those things. 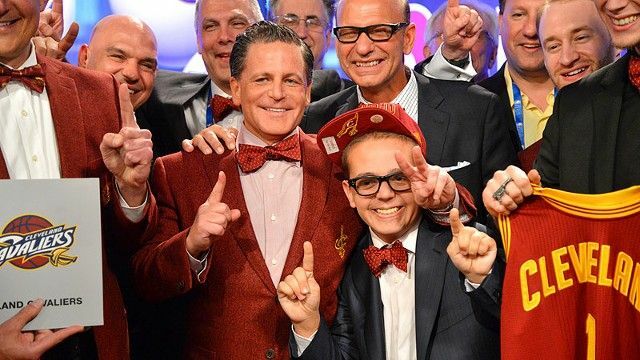 When we tuned in to the lottery show Tuesday night the first thing we noticed was the odd entourage that Cavs owner Dan Gilbert brought with him to New York City. Gilbert put together what we're sure he believed is a group that "represents" Cleveland but once again he missed the mark. Is Gilbert a little bit eccentric? Sure, but rich people are different than the rest of us. Is he mostly harmless? Probably, as long as you steer clear of the downtown casino and don't go to him for a mortgage. Mostly he comes off as someone working overtime trying to show how hip and irreverent he is, but in the end comes across as the opposite. When we saw Gilbert's merry band of eclectic misfits - from celebrity chef Michael Symon to sports talk host Tony Rizzo and rapper Machine Gun Kelly - we weren't surprised. But we were once again confused why Gilbert wouldn't bring people who actually have a connection to the team. It was nice a couple of years ago when Joe Haden and Josh Cribbs tagged along, but ... they play for the Browns. Why not bring some ex-Cavs to the show? Jim Chones, Austin Carr and Campy Russell all still live in the area and have a connection to the franchise, why not give them some national airtime? And that have to be some season ticket holders who have been around since the pre-LeBron James era; what about them? Anway, while we were disappointed we weren't surprised by Gilbert's group. Then the Cavs got lucky and landed the No. 1 pick - always better than dropping down a few slots - and we switched back to watching the Tribe lose to Detroit. Zach Lowe at Grantland watched the same spectacle as everyone else and wrote about it Wednesday. 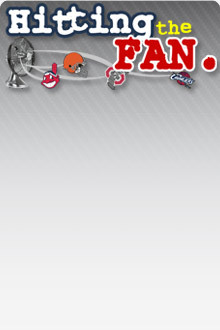 We read the article - thought it summed up the zaniness pretty well - and went back to watching the Tribe lose to Detroit. So we were surprised when that innocuous story caused such a reaction throughout Cleveland. From complaints that fans can't enjoy the Cavs actually "winning" something to criticisms of Gilbert and everything in between, this otherwise minor event has now entered the vortex and been elevated to being a thing. After reading and hearing some of the complaints we went back and read Lowe's story a couple more times and we still don't see what all the fuss is about. Were Gilbert and the boys a bit over the top and goofy? Sure, especially Rizzo, who left any journalistic integrity he may still have on the tarmac in Cleveland when he set foot on Gilbert's private jet. It's one thing to go along with the intent of reporting on the event (or in the Browns case, sitting in the team cafeteria looking at your smart phone), but to tag along as part of the group and make a spectacle of yourself is something else. If there is anyone left who listen's to Rizzo's show and believes he has any integrity or is in any way impartial when talking about the Cavs, they should hopefully know better now. (Although the average listener to Cleveland sports talk radio probably doesn't understand or care about those concepts in the first place). Other than that, what did Lowe really write that anyone watching couldn't see on TV? Sure, it's a bit goofy to celebrate winning something that is pure luck, but Lowe didn't really make fun of anyone (or at least not anyone who wasn't deserving) and he didn't take any of the typical shots at the city of Cleveland. They also might have the cleanest cap sheet in the league, with about $20 million in cap room and zero fully guaranteed deals yet on the books for 2014-15. (That last bit will change once Cleveland makes its picks next month and executes no-brainer options on Kyrie Irving, Tristan Thompson, and Dion Waiters.) Waiters and Thompson are promising players, and the idea of pairing Irving with a potential Tyson Chandler type in Nerlens Noel is appealing. But there are a lot of unknowns in that equation, and the Cavs will think hard about whether it’s best to exchange some of those unknowns for a young-ish known franchise player type who might become available via trade. Next summer’s unrestricted free agency class has some glittery names, including LeBron, but some of those names (including LeBron) have various option clauses in their contracts, and Cleveland’s record of drawing big-time free agents isn’t exactly robust. The two names you’ll hear most often, Love and LaMarcus Aldridge, aren’t eligible for unrestricted free agency until (at the earliest) after the 2014-15 season. That’s a long time to hoard cap room. The Cavs have a war chest now, much like the one Houston piled up for use in the James Harden deal. We don't know, doesn't seem much to get worked up about in there. The most important "thing" to come out of Tuesday night was the Cavs walking away with the top pick in the upcoming draft. How they want to use the pick is completely within their control and that is a good thing. As fans we can get a bit edgy when one of our teams gets disrespected and all the losing certainly takes its toll. We get that. But to get worked up about someone pointing out that the owner of one of our teams is acting goofy? That's being a bit thin-skinned. After all, there are more important things that we should be talking about. Because did you hear about the throw that Brian Hoyer made against the Browns third-team defense today in practice?